Summary: Les Cirque des Rêves (The Circus of Dreams) appears without warning. Tied to this enchanted circus is illusionist Celia and her challenger Marco, both of whom have been bound to compete in a mysterious game since their youth. Unknowingly along for the ride are Tsukiko the contortionist, Herr Friedrick Thiessen the clock-maker, and Poppet and Widget, the powerful red-headed twins born opening night. 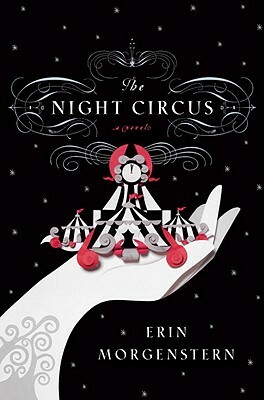 Beautiful, haunting, and bursting with imagination, The Night Circus is a literary journey you will be hard pressed to forget. The first thing that drew me to this amazing novel was the gorgeous cover. Look at that, it’s beautiful. The UK cover is also equally stunning, but I’m really drawn to this US cover, particularly due to the fact that the entire thing looks like it’s made from construction paper. The second thing that drew me in was the theme of both magicians AND the circus. There are a lot of wonderful novels out there about the circus: Dreamland, Geek Love, Freaks! Alive, on the Inside!, Water, or as I like to call it, H20 for Elephants, but not so many about magicians. Now, I have read The Prestige, but it was one of those rare cases where the movie was better than the novel. Shocking, I know. It might have helped that the movie has Hugh Jackman in it. Thankfully, the Night Circus features magicians, a circus, and is written extremely well; that last bit probably being the most important facet. There is A LOT going on in this novel. It opens up with magician Prospero the Enchanter (AKA Hector Bowen), a REAL magician disguised as a run of the mill magician and his estranged teacher, Mr. A. H. (AKA the Grey Suited Man). They discuss a mysterious game where two challengers are pitted against one another in a chosen venue. Neither the details, specifics, or resolution to this game are discussed. Prospero chooses his naturally talented daughter Celia and Mr. A. H. picks Marco from an orphanage for his love of reading. If he had picked Tom Riddle, maybe Harry Potter would have parents. The story that ties all these together revolves around the circus itself. Originated by eccentric bajillionaire Chandresh Lefèvre during one of his infamous Midnight Dinners (which would require an entire new post to go into detail about), Les Cirque des Rêves is designed to be the end all be all circus. With help from his counterparts, Mme. Padva (a ballerina known for her aestheticism), Ethan W. Barris (engineer and architect), Tara and Lainie Burgess (business consultants) and Mr. A.H. the creators envision a black, white, and grey series of striped tents, with splashes of red prominent throughout, the central focus being a giant clock tower. Like they do in Back to the Future. This clock tower is made by Herr Friedrick Thiessen, who I couldn’t help but imagine being portrayed by David Bowie as Nikola Tesla. After visiting the circus, Thiessen becomes obsessed with it, publishing his writing about his experiences in local papers and quickly gaining followers who he corresponds with. These other circus fanatics take to calling themselves rêveurs (dreamers) who can be recognized by their black/white/grey wardrobes and a bright red accessory. Some rêveurs take to following the circus around from location to location, writing and trading experiences with other rêveurs. It’s a wonderful subculture, akin to Rocky Horror Picture Show fanatics. Minus the toast throwing. Every novel has to have a little romance, and this can be found in star-crossed lovers (what does that even mean, honestly?) Celia and Marco, who fall in love despite being opponents. They’re a much cooler (and magical) Romeo and Juliet. Celia finds her way into the circus because she hears they are looking for illusionists and Marco is Chandresh’s assistant, placed there by his mentor Mr. A. H. As with my favorite romances, Celia and Marco know they cannot be together (because of the game) but cannot help being drawn to one another regardless. However, this does not stop them from collaborating on amazing tents to add to the circus, which I will have to talk about later because they’re all so wonderful and dammit I’m still getting through the very surface of the plot! Finally, there is the story about red-headed twins Poppet, Widget, and their friend Bailey. Bailey is a farm boy who longs to escape his hum drum life. However, he sadly realizes that even if life were a fairytale, only girls ever get to go on fantastical adventures. And here I will refrain from yet another Harry Potter joke. I will also refrain from mentioning Bailey’s desire to be a girl. Interspersed between all these tales are snippets about the circus, written in the 2nd person as if you the reader are experiencing the circus first hand. It’s extremely depressing because by the end of the narrative you wish you could actually visit the circus. Unfortunately such a thing would be impossible because magic isn’t real. Except on Pottermore. So many Potter jokes in this post, so little time. It would be remiss of me not to discuss the circus itself. There are stalls which sell delicious confections liked doughy cinnamon balls, chocolate mice, spun sugar, and mulled cider. I’m getting so hungry just typing this, because this novel is so visceral that you could almost taste some of the food. There are tents where one can watch contortionists, get their fortune told, or marvel at illusionist Celia Bowen, who can transform capes into ravens and take things apart and reform them at will. One tent is full of jars containing memories, and when one opens a jar their body is taken over with specific smells, tastes, and feelings. There is a garden made entirely of ice, a Hall of Mirrors where body parts disappear and mysterious visions appear from nowhere, and the Pool of Tears where one can take the burden from their soul merely by placing a smooth stone in a pool. If only it were so easy. The three best attractions however are the Cloud Maze, the Labyrinth, and the Carousel. In the Cloud Maze, a series of pathways take you higher and higher, and when you come to an end of a walkway, you merely have to jump into the fluffy clouds around you, which will softly bring you back to earth. The Labyrinth is essentially a giant maze full of rooms that snow, or a library with floating books, rooms made entirely out of written words, etc. You could enter it again and again and still get a completely different journey every time. Last but not least is the carousel (I love me some carousels!). Like the rest of the circus it’s black/white/grey. Unlike a normal carousel the animals are suspended/floated only from above and are shaped like mythological creatures. And get this, the carousel doesn’t go in a circle, but disappears being a wall and takes the rider on an altogether different kind of journey. We’re never told what this is, but I’m sure it involves a magical ring of power. -Did I mention that it’s set in the late 1800 and early 1900’s? BECAUSE IT IS! -Why can’t this actually exist!?! In the afterward, I read that this novel was partially inspired by the independent perfume company Black Phoenix Alchemy Lab, who I happen to be a devotee of. (Check out their literary inspired perfumes!) Much like Les Cirque des Rêves, their circus inspired line Carnaval Diabolique has recently vanished from the website, with promises to “… Return when least expected”. This seems worth a look. Great and thorough review. This book was so damn magical. Like you, I just want this place to exist. Please please please. Unlike you, I did not think the carousel was a “top 3” attraction. The Cloud Maze and Labyrinth are hard to argue with, but for a third I would personally choose The Wishing Tree because of the concept of one wish igniting another. I think I’m biased as a huge carousel fan. =) Also if this place were real I think I would live there. If only such a thing were physically possible to create. Shame no “Night Circus” fans won the lottery. Well, I’m sold. I initially had no intention of getting this book (despite my love of circus-related books) because the blurb on the dust cover made it sound (to me, anyway) like some wimpy romance novel. But your review is so in depth and you make it sound so intriguing, I kind of have to get it now! Thanks. Very low on romance and high on magic and fantasy. I hope you enjoy it!